OK. I realize these are not “real food” but they are simple, frugal and allergen-free! Besides, I used Organic Rice Puffs ($1.63 per bag through subscribe and save on Amazon!). That counts for something, right? In my eyes, these are a great alternative to cake or cupcakes. For me, cake is nothing but a vehicle for frosting. Don’t get me wrong, I like Rice Krispie treats, but frosting Rice Krispie treats turn them into something special. One of my goals as a Mom, is making sure Bella never feels left out and has alternatives to fun food. Because these are so quick to throw together, I can make them at the last minute before running out to a birthday party or special event. This ensures Bella has something special too. 1. Grease a 9 x 13 pan. 2. In a large saucepan, melt margarine over low heat and add marshmallows. Stir until completely melted. 3. Remove from heat and add cereal, stirring to coat evenly. 4. Scoop into prepared pan and press into pan with greased fingers. You might also like Dairy-Free Caramel Sauce/Dip and Wheat-Free, Dairy-Free and Egg-Free Chocolate Fudge Cake. « Charmin Toilet Paper Shipped to Your Door! “cake is nothing but a vehicle for frosting”. AMEN! 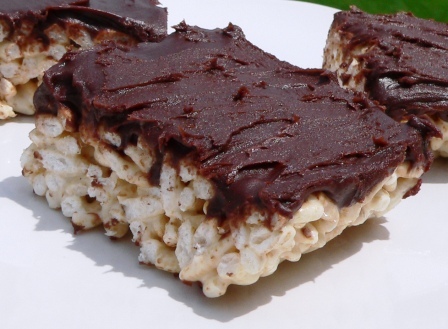 I love rice krispie bars, especially when they are covered in chocolate frosting. Thanks Allison. I’ll check it out. Great recipe. Thanks for the printer friendly version. A perfect treat to my kids!The kids love ’em! Thanks for stopping by Clarissa! Rice crispies were my favorite when I was little. I’ve never tried chocolate covered ones though. They look super yummy! I think all kids like rice krispies. I know I did too. Why aren’t they real! They look really delicious! Thanks so much for sharing on Momtrends this week. Happy Memorial Day! Now which one of us wouldn’t just love this special treat. It just looks delicious! Thanks for sharing with Full Plate Thursday and come back soon! These are real food to me! LOL anything topped with chocolate is, anyway. As you said, they are a wonderful alternative to cakes and cookies. 🙂 Thanks for sharing and have a wonderful weekend. 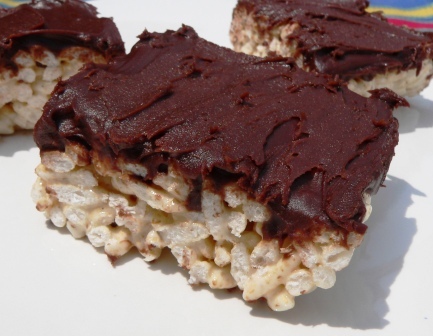 Why have I never thought of frosting rice krispies? Yummy! Thanks for sharing this at Fat Camp Friday this weekend. Enjoy your weekend, see you next week! saying rice krispie treats aren’t real food is like declaring there is no santa claus 🙂 this is a great alternative to what is a national treasure! thank you for sharing with tuesday night supper club! Make your own frosting too. Basic recipe is powdered sugar, shortetning, cocoa for chocolate, liquid. So easy and you can sub ingrediants that fit your child’s allergy profile. You saved the day again Nancy. My daughter is finally looking at the food her friends are eating and want the same. Thank you for your treasure trove of recipes! You are so sweet Stephanie! I hope Zoe is doing well.